​Bayern Munich cut the gap at the top of the Bundesliga table as they beat Schalke 3-1 on Saturday evening. After dominating the opening ten minutes, Bayern took the lead through Jeffrey Bruma's own goal. The Dutchman was unlucky to bundle the ball into the back of his net, though the hosts took a deserved lead early on. Serge Gnabry gave Die Roten a comfortable lead in the 57th minute, as he headed in Lewandowski's attempted overhead kick. The win sees Bayern move within five points of league leaders Borussia Dortmund, who were held to a ​3-3 draw against Hoffenheim on Saturday. Here's our breakdown on Saturday's ​Bundesliga clash. ​Bayern Munich were ruthless at the Allianz and started the game very well, producing a number of big chances before taking the lead after 12 minutes. They were in control all game and dominated a lacklustre Schalke side in a fantastic performance by Niko Kovac's side. 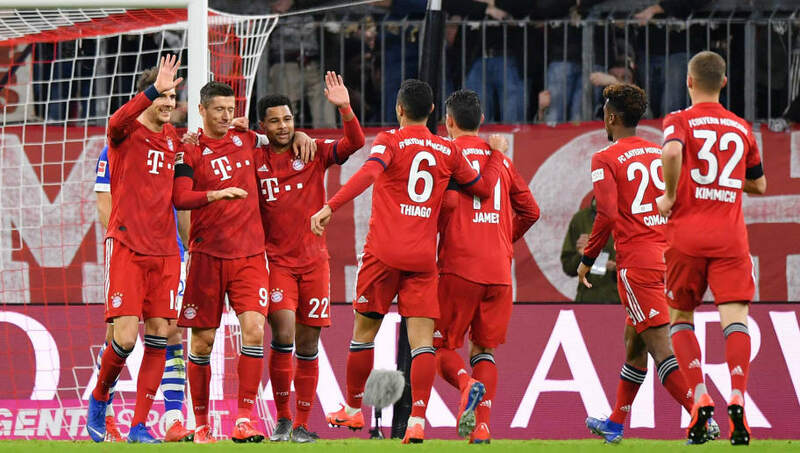 Bayern capitalised on their chance to close in on rivals ​Borussia Dortmund, as both Dortmund and Borussia Monchengladbach dropped points on Saturday. It was a positive response to last week's defeat to Bayer Leverkusen as they closed in on top spot in an emphatic display. STAR MAN - Robert Lewandowski stood out in another ruthless performance up front. The Polish striker grabbed his 25th strike of the season and was involved in both of Die Roten's other goals, as he once again proved himself in a wonderful performance at the Allianz. ​Schalke were second best all evening, but could've got something from the game after equalising midway through the first half. However, a lapse in concentration allowed Bayern to retake the lead, retake control of the game and eventually take all three points. It was a poor performance from Domenico Tedesco's side and their poor form showed against the champions. The defeat sees Schalke drop down to 13th, seven points off the relegation play-off spot. If they want to maintain their Bundesliga status then they desperately need to improve. STAR MAN - In a game of little individual quality for Schalke, Ahmed Kutucu did impress on his full Bundesliga debut. The 18-year-old finished brilliantly to equalise for his third goal for Schalke, and showed his great potential for the future in a bitter defeat. ​Both sides are back in Bundesliga action next weekend, before huge games against English sides in the first leg of the Champions League round of 16. Bayern are back in action with a Bavarian derby next week, as they travel to struggling Augsburg next Friday. They then face a huge test on 19 February, when they play ​Liverpool at Anfield. Schalke have back to back home fixtures starting next Saturday, when they welcome Freiburg to the Veltins-Arena. They are then back in action on 20 February, as they host reigning Premier League champions ​Manchester City.